Online casino players that prefer to deposit and withdraw winnings in cryptocurrency are getting more and more choices. 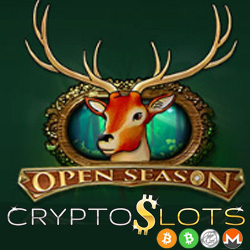 Cryptoslots, a cryptocurrency casino from Slotland.com, has just added a new hunting-themed game called Open Season. Until Sunday, Cryptoslots is giving players 42% extra on their deposits for extra play time in the new slot game.